Home European Football La Liga Is £99m for 33-year-old Ronaldo good value for Juventus? Cristiano Ronaldo has completed his 112m euros (£99.2m) move from Real Madrid to Juventus after 450 goals in 438 games for the club. But can that possibly be good value for a 33-year-old? And is he in decline? Where does the deal rank in all-time list? Ronaldo’s move to Juventus makes him the fourth most expensive player of all time (he is also the seventh for his 2009 move to Real from Manchester United) – third if you exclude Kylian Mbappe’s expected 180m euros (£159m) move to Paris St-Germain. It almost trebles the most expensive transfer fee ever for a player aged 30 or more. Leonardo Bonucci’s reported 40m euros (£35.1m) move from Juventus to AC Milan last summer was the record. He has won the past two Ballons d’Or for the world’s top player – and four of the past five. He has also been named in the past 11 Fifa Fifpro World XI and Uefa Teams of the Year. 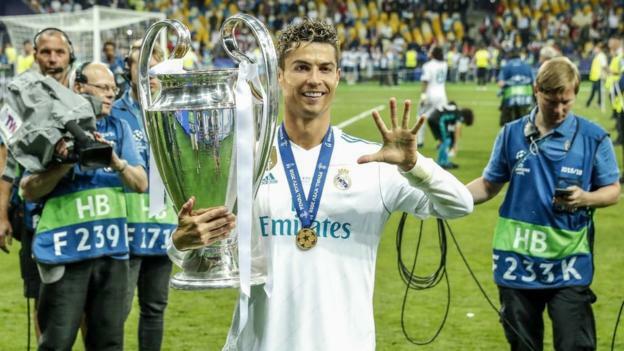 He has won the Champions League for three consecutive years – and has won the Golden Boot in that tournament in each of the past six seasons – including one season when he was joint top scorer – and also won it once 10 years ago with Manchester United. Of his 15 goals last season, three were against Juventus including a sensation bicycle kick which earned him a standing ovation from the Juventus Stadium faithful. As well as winning the Champions League Golden Boot, Ronaldo also managed to finish second top scorer in La Liga – despite scoring only four times in the first half of the season. He hit 22 league goals from January onwards, despite not playing in seven games. He is still the second top scorer at the ongoing World Cup, with four goals including a hat-trick against Spain, despite Portugal’s last-16 elimination. Those goals made him the second top scorer in the history of international football with 85. Interesting, the answer is yes according to a football financial expert. He thinks the money Juventus, who have won seven consecutive league titles, earn from Ronaldo “should more than cover the transfer fee and his wages. It should also attract other players and help with the younger members of the squad”. The 44 games he played last season were the fewest since his opening Real Madrid season. But he only missed two games because of injury last term and was rested for several domestic games as Real, who were never in the title race, concentrated on the Champions League. He no longer has the legs of the swashbuckling wide player he once was, reinventing himself as a centre forward. Of his 44 Real appearances last season, 31 of them were as a striker with 13 on the wing. Back in 2013-14 he made only one centre-forward appearance. During the World Cup, his Portugal coach Fernando Santos said: “He is like a Port wine. He knows how to refine his capacity and age at his best. “He is constantly evolving, contradictorily to the other players. He knows himself and he knows what he can do. And his international boss thinks he could play at the next World Cup at the age of 37.